So, you've decided to be a knight errant, bound for adventures in the kingdom! And who wouldn't be all about that life? Daring quests for honor, fierce battles against tyrant usurpers and dangerous magical creatures, exhilarating castle-storming to save beautiful maidens from evil wizards, brave crusades across the wide and narrow sea to find sacred chalices (and to maybe do a little sunbathing after you've safety landed along the beaches of France...after all, you're a knight errant, not a machine)! And that's just your day schedule...we don't even have time to talk about all the mead-drinking, merry-making, and maiden-wooing you'll be doing at night! Buuuuuut it's probably not a good idea to wander into field battles and dark dungeons and enchanted forests all willy-nilly without any form of protection against your enemies. That's where this Round Shield comes in handy! It's based on the buckler shields used in during the Medieval era, so you'll look ready to tackle any foe in your path. 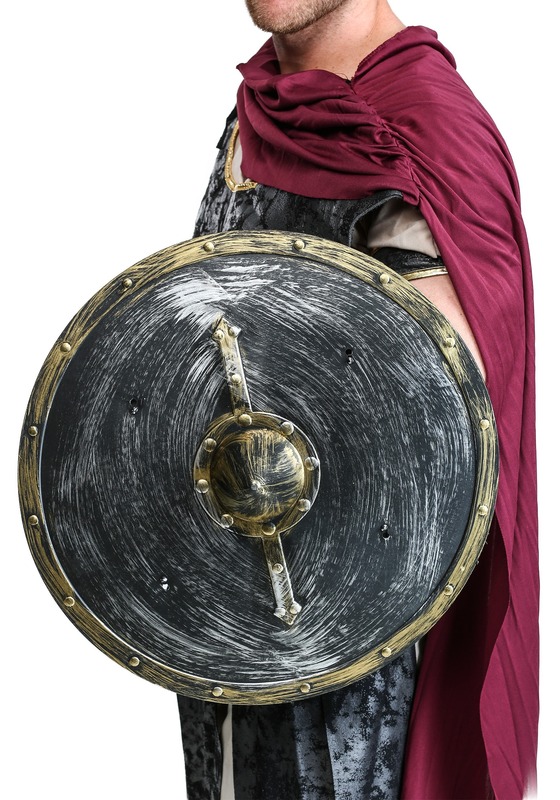 Just slide your non-writing arm into the 2 arms straps on the back and you're ready to defend your precious bod against any foe (or friend who turns out to be a foe, as often seems to happen in when the times are medieval)! Standard Shield Width 18" x 18" 18" x 18"